ICTO is gradually upgrading the operating system from Windows 7 to Windows 10 for the computers issued by ICTO. All staff members will benefit from the new features, performance and security improvements that Windows 10 brings along. Starting from January 2019, ICTO has implemented the second phrase of Windows 10 deployment project. In this second phase, we plan to upgrade 422 desktop and notebook users. New computers will be installed with Windows 10 64bit, Microsoft Office 2016 and Solid State Drive (SSD). 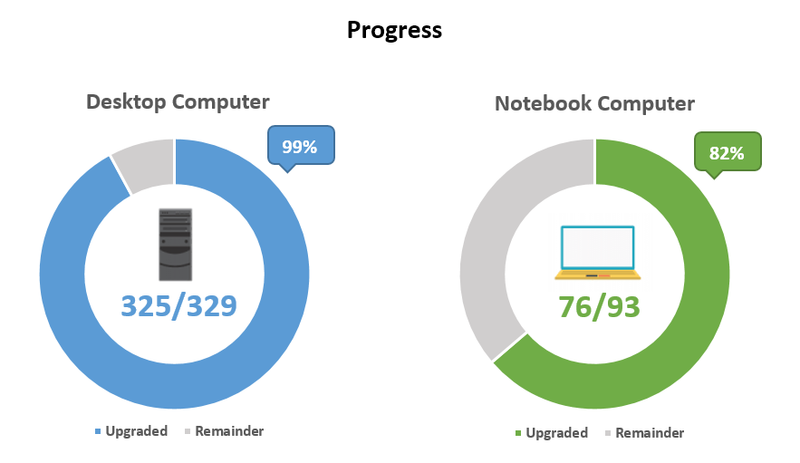 Until 1 April 2019, ICTO has upgraded 325 desktop computers (99%) and 76 notebook computers (82%). In addition, you can find more support resources about Windows 10 via ICTO Knowledge Base and Webpage.